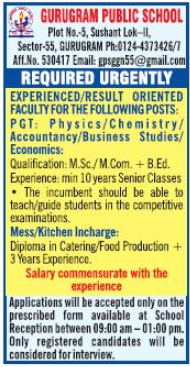 Gurugram Public School, Gurugram has advertised in THE HINDUSTAN TIMES newspaper for the recruitment of PGT jobs vacancies. Interested and eligible job aspirants are requested to apply by earliest . Check out further more details below. About School: Gurugram Public School, a Senior Secondary School with CBSE affiliation and a vision of modern education and ethics was established in June 2001 under the able guidance of Padmashree R S Lugani, the founder Principal of DPS, RK Puram, New Delhi. It has an enrollment of 900+ students with 25:1 Student Teacher ratio. A team of highly qualified and dedicated teachers strive hard to bring about all round holistic development in each child.